Four Tahoe ski resorts have received 600 inches or more of snow this season. 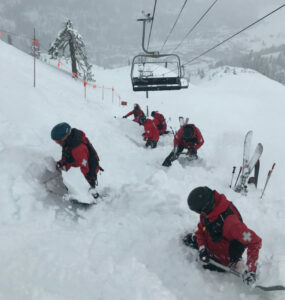 Employees shoveling a path below buried ski lifts was a frequent occurrence this season at Squaw Valley ski resort in Lake Tahoe. Not surprisingly, there are at least two weeks remaining for all 14 Tahoe ski resorts, so skiing and snowboarding Lake Tahoe will continue with terrific spring conditions. Seven of the 14 Tahoe ski resorts will conclude the season on Easter Sunday, April 21. Five Tahoe ski resorts will stay open, the latest being Squaw Valley through July 7. Both Alpine Meadows and Heavenly Mountain will remain open weekends in May. Annually the latest Tahoe ski resort to remain open, Squaw Valley will have that distinction again this season and also has the most snow with 675 inches as of April 8. Amazingly, Squaw Valley had 300 inches of snow in February and exceeded the 600 mark by early March. Boreal Mountain has 581 inches of snow this season and provided many of powder days for snowboarders and skiers.